At the close of the retreat my soul is full of many emotions. God has been more than good to me, has given me great lights and wonderful graces. During the whole month my eyes have been opening more and more to the disorder of my past life. I have been simply amazed and astounded how I could possibly have lived the life I did, especially my years in college, such abuse of grace, such awful waste of time, neglect of opportunities of learning, of becoming holy, and above all the harm this careless tepid life has done others. I have realised how little I thought about committing sin and far less, of deliberate breaches of rule. Now, through God’s great mercy, I feel an intense hatred of such a life, and as if it would be impossible ever again to live so. I feel that indeed the retreat has worked a marvellous change in me. I feel I am not the same in my views, sentiments, and way of looking at things, that I am a different man. I have never felt as I do now after any other retreat before God must indeed have poured His grace abundantly into my soul, for it seems to me that a deep lasting impression has been made, which I trust will ever remain. My soul is in great peace. I feel as if at last I have given God all He wanted from me during so many years by making the resolutions which I have made; that I could now die content, for at last I have really begun to try and serve the good God with all my heart. 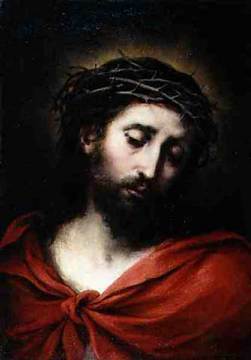 I feel also a great longing to love Jesus very, very much, to draw very close to His Sacred Heart, and to be ever united to Him, always thinking of Him and praying. I long ardently to do something now to make up for my neglect in the past — to give myself heart and soul to the service of Cod, to toil for Him, to wear myself out for Him. I wish to be able never to seek rest or amusement outside of what obedience imposes, so that every moment may be spent for Jesus. I have not a moment to lose, I cannot afford to refuse Him a single sacrifice if I wish to do anything for Jesus and become a saint before I die. If I go to the Congo, I certainly shall not live long. In any case can I promise myself even one day more? I must try to look upon this day as my last on earth and do all I can and surfer all I can for these few hours. It is not a question of keeping up full steam for years, but only for to-day. If I am faithful to the resolution of “doing all things perfectly,” I shall effectually cut away the numerous faults in all my actions. By working hard at the Third Degree I shall best correct those things to which my attention has been drawn. I know all this is going to cost me much, that I shall have a fierce battle to fight with the devil and myself. But I begin with great hope and confidence, for since Jesus has inspired me to make these resolutions and urged me on till I did so, His grace will not be anting to aid me at every step. In the name of God, then, I enter upon the Narrow Path which leads to sanctity, walking bravely on in imitation of my Jesus Who is by my side carrying His cross. To imitate Him and make my life resemble His in some small degree, will be my life’s work, that so I may be worthy to die for Him. Thank You, O my God, for all the graces of this retreat, above all for bringing me at last to Your sacred feet. Grant me grace to keep these resolutions and never to forget my determination to strive might and main to become a saint. COMMENT: The retreat of 1907 had a profound effect on Fr Doyle. In this passage he summarises his reflections as the retreat came to an end 111 years ago today. Despite the impression given in his personal notes, Fr Doyle did not live a bad life prior to this retreat, although the experience of the retreat did highlight for him the areas of his life where he lacked fervour and dedication. Many people have radically reformed their lives following the experience of a retreat, and especially after the experience of the Spiritual Exercises. In the case of Fr Doyle it is clear that a radical deepening of his commitment to Christ took place. Perhaps this is a good occasion to make a resolution to attend a retreat at some stage this year. Today is also the feast of all the saints of the Benedictine Order, or more specifically, the feast of all the saints who lived under the Rule of St Benedict. This is an extremely extensive list. I think it is probably the case that there are more Benedictine saints than from any other order, although perhaps that is not too surprising since the order has been around for many centuries longer than others have! 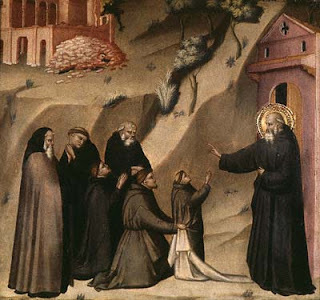 Let us be thankful today for all of those saints who, inspired by St Benedict, evangelised the West and preserved learning and culture in a dark period of history, not too unlike our own in some respects. May we follow their example, especially by incorporating Fr Doyle’s methodology of faithfulness in the little things of life. The reason I find it so hard to love God, why I have so little affection for Him, is because of my attachment to venial sin and my constant deliberate imperfections. I have, as it were, been trying to run with an immense weight round my feet; I have tried to reach the unitive way without passing through the purgative, to jump to the top of the ladder without climbing up the steps; so that after all these years I am still as barren of real love of God as when first I entered religion. No, I must work earnestly now to remove the very shadow of sin from my life, then to imitate the humble suffering life of Jesus and thus win His love. I look upon it as a great grace that in spite of my tepid life Jesus has given me an ardent desire to love Him. I long eagerly to love my Jesus passionately, with an intense ardent love such as the saints had; and yet I remain cold and indifferent with little zeal for His glory. COMMENT: Fr Doyle wrote these words 111 years ago today, during the Fourth Week of the Spiritual Exercises. Back then, reasonably educated Catholics would have understood what Fr Doyle referred to when he wrote about the unitive and purgative way; we hear much less about this idea today than in the past, but it remains a fundamentally important aspect of Catholic spirituality. The idea is that we are called to union with God, not just in heaven, but also in a sense in this life as well. However, we cannot “jump to the top of the ladder without climbing up the steps”; thus we must pass through the purgative and illuminative way first. The first stage involves the fight against mortal and deliberate venial sin, and necessitates the development of personal discipline. This is precisely why Fr Doyle is such a great example for us. His personal notes and reflections, detailed so well in Alfred O’Rahilly’s biography (which is available by clicking on the link in the right hand column) provide a tremendously detailed tactical guide for the spiritual life. Certainly there are aspects of Fr Doyle’s life that should not be copied by others – he received many great graces and much was asked of him. But in many other respects his life and teaching is of very great relevance for us today, especially with respect to performing our duties with love and making small penitential sacrifices. 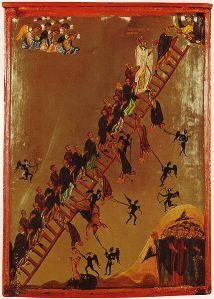 Fr Doyle’s simple spiritual tactics are an excellent guide to help us climb the ladder of the spiritual life. My God, I promise You, kneeling before the image of Your Sacred Heart, that I will do my best to lead a martyr’s life by constantly denying my will and doing all that I think will please You, if You in return will grant me the grace of martyrdom. COMMENT: In this way Fr Doyle brought an end to his notes on the Third Week of the Spiritual Exercises during these days in 1907. We should we seek martyrdom carelessly or indiscriminately, although we should be open to this if it be God’s will. But we should attempt to live with a spirit of martyrdom – a spirit of detachment – in everyday life. We can most readily do this in our everyday tasks by being faithful to them, especially when we don’t want to be. 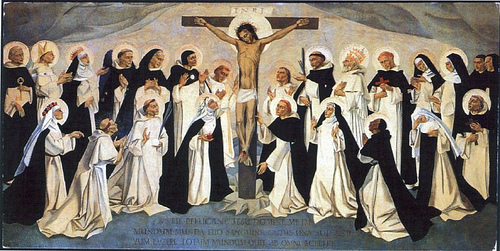 Today is also the feast of all of the Saints of the Dominican Order, many of whom were martyrs. What an amazing list of saints there are attached to this blessed Order! They include 3 Doctors of the Church, one of whom is one of the greatest theologians in the history of the Church (St Thomas Aquinas), one of whom is the patron of science and scientists (St Albert the Great) and one of whom is one of the very greatest women in history and a co-patron saint of Europe (St Catherine of Siena). 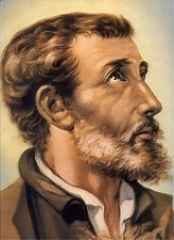 Included in the extensive list of Dominican saints are many martyrs, including two Irish martyrs who have been beatified (Terence O’Brien and Peter O’Higgins) as well as over 90 other Irish Dominican martyrs who will hopefully be canonised one day.